What Is a Lightning Component? What Is a Bolt Solution? What Is a Lightning Data Solution? Define what an app is. Define what a Lightning component is. List the six stages of the AppExchange product lifecycle. Describe what happens in each stage of the AppExchange product lifecycle. You know that the AppExchange Partner Program supports you on the journey from idea to marketplace, but what does that journey look like? In this unit, we introduce you to the six stages of the AppExchange product lifecycle. You’ll also learn how this development model positions you for success. But first, let’s talk about the kinds of things you can build and sell using the Salesforce platform: apps, Lightning components, Bolt solutions, Lightning Data solutions, and Flows. Apps solve business problems. If you’ve customized Salesforce to get a job done faster or make a task easier to perform, you probably built an app without knowing it. As an AppExchange partner, think of an app as a customization of the Salesforce platform that you can distribute to others. Here are some things that are right at home in an app. For a complete list of what you can include in an app, check out the ISVforce Guide. Now let’s talk about Lightning components. Lightning components are building blocks for apps. They’re self-contained and reusable, and they let Salesforce customers design solutions to business problems with an intuitive, drag-and-drop interface called the Lightning App Builder. Let’s look at a quick example of how someone could solve a business problem using components created by an AppExchange partner. 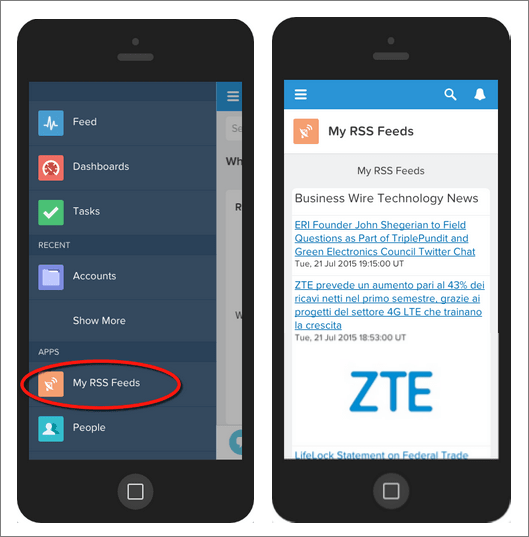 Imagine there’s a Salesforce admin who wants users to be able to read technology news on the Salesforce mobile app. Instead of engineering a solution from scratch, the admin decides to leverage Lightning components: pre-built components from Salesforce (1) and components offered by AppExchange partners on the AppExchange (2). The admin uses the Lightning App Builder canvas (3) to create an app that plugs in to a technology news feed. Without writing a line of code, the admin’s users can stay current with technology news. And building the app was easy, in large part because of an AppExchange partner. Lightning Bolt Solutions are Community solution templates that help customers get up and running faster and with far less investment than was required before. Lightning Bolt Solutions contain a bundle of branded customized communities, process flows, lightning components and apps, all integrated seamlessly with the Salesforce Platform and CRM. We built a powerful and flexible set of capabilities into the Salesforce platform that we call the Lightning Data Engine. It uses sophisticated matching algorithms and machine learning to make it easy to implement and deliver strategic data and insights from trusted third-party sources. Best of all, seamless integration requires minimal ongoing maintenance, and makes data readily available on any device without IT involvement. We have offerings for every industry and budget. We make it easy to try out things before buying. Our security team comprehensively evaluates every offering. It’s got a beautiful, mobile-friendly user interface that makes browsing and search simple on any device. When you join the AppExchange Partner Program, you become a part of this relationship. When you’re ready to distribute a solution, our publishing tools make it easy to put your listing in front of millions of customers. If you haven’t used the AppExchange before, it’s worth exploring. Browse around a bit, watch some demos—we’re sure you’ll see why it’s an incredible asset for AppExchange partners. In the example earlier, you saw how an admin used Lightning components to build an app for getting the latest technology news. But what about the rest of the story? Where did the component come from, and how did it get on the AppExchange? How did the admin hear about it, and was it free or licensed? 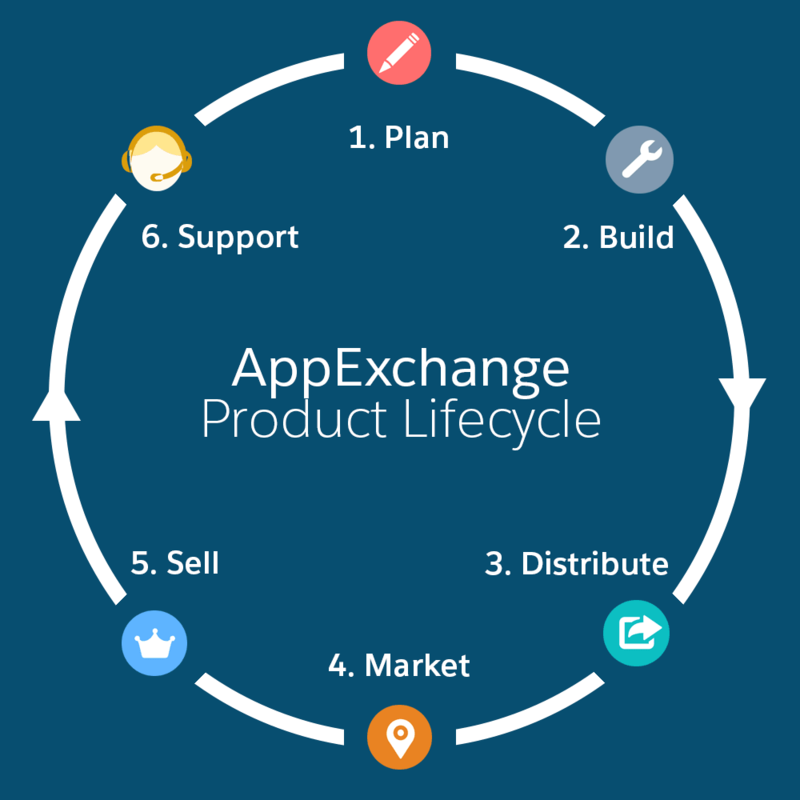 To answer these kinds of questions, you need to understand the AppExchange product lifecycle. The AppExchange product lifecycle is your roadmap for everything from ensuring that you’re building the right product to supporting that product after it’s launched. The stages of the AppExchange product lifecycle are: Plan (1), Build (2), Distribute (3), Market (4), Sell (5), and Support (6). Who comprises your target audience? Are you going after large enterprise customers? Mid-size? Small? What is your business strategy? When and how much must you sell to have a successful business? Which Salesforce editions will you support? For example, Professional, Enterprise, or Unlimited. Which license type do you want to use? We offer CRM, Platform, and Communities. Is your staff familiar with the Salesforce platform? If not, get them up to speed using resources like Trailhead. What is your strategy for ensuring that your offering is secure? Making a plan and sticking to it sets up your team for success. In this stage, we support you with training to help you and your team to become certified developers. 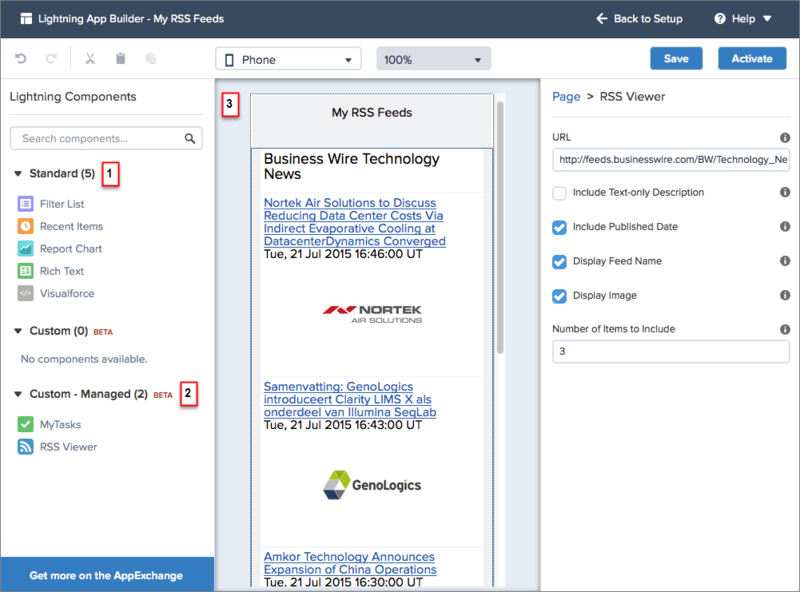 We also let you create test orgs so that you can learn firsthand how Salesforce works. In this stage, you create your solution using clicks or code. Then, when it’s built, you test it to make sure that it provides a great customer experience. Start by setting up development and test environments customized especially for AppExchange partners. The development environment is where you implement your design, while the test environment is where you verify that everything works as planned. Salesforce DX is our new developer experience. If you haven’t already done so, complete the Get Started with Salesforce DX trail. In the trail, you learn about the tools and methodologies that make up Salesforce DX. We support you with training about software development best practices, such as the Agile methodology. And while the technology team is hard at work, your business team develops your go-to-market strategy, which includes plans for marketing, sales, and support. It's time to release your solution to customers. Start by packaging your functionality and uploading it to the AppExchange. Next, you create an AppExchange listing so that your offering can go through final review. We support you by conducting a comprehensive security review of your solution. In this stage, you generate customer interest in your solution. Reach out to your target audience, leverage marketing opportunities at partner events, and optimize your AppExchange listing so that it excites customers. We support you with training from our Partner Marketing team, which draws from industry best practices and lessons learned by top AppExchange partners. The goal here is to convert leads to paying customers. You want to build an effective sales team, qualify leads efficiently, and present compelling demos to prospects. After your solution gets footing in the market, you can grow your pipelines and manage renewals. We support you with training from Partner Account Managers, our direct sales teams, and top AppExchange partners. Facilitate ongoing customer success with your solution. Create and implement a customer success plan, provide support and troubleshooting assistance, and make improvements to your solution through patches and upgrades. While you support customers, we support you. We have tools that tell you how customers use your solutions and that allow you to provide hands-on help as people encounter challenges. After you complete the lifecycle, the process repeats. Plan and build new features, distribute updates, sell and market new capabilities, and train your support team.